Entrance gateway to the old Rajwada Palace, Kolhapur. bl.uk > Online Gallery Home	> Online exhibitions	> Asia, Pacific and Africa Collections	> Entrance gateway to the old Rajwada Palace, Kolhapur. 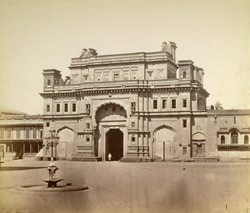 Lee-Warner Collection: 'Bombay Presidency taken by an unknown photographer in the 1880s. In 1675 Kolhapur was conquered by the Maratha chief, Shivaji, and later inherited by his younger son. The state remained with the Bhonsales (one of the Maratha princely families) until Indian independence.This is a view showing the palace courtyard looking towards the gateway. The Palace has a central stone gateway and wooden pillars. There was a grand Durbar Hall on the second floor. The royal family lived here until Independence.